Elements Applied: Each plant’s part except the root is applied in herbal medicine. Phenolic acids; chlorogenic, ferulic, vanillic, isoferulic, caffeic, and p-coumaric acids. Used For: The herb is applied to boost metabolic rates, induce urination, promote heart activity, reduce fevers, treat constipation, and relieve skin rashes. 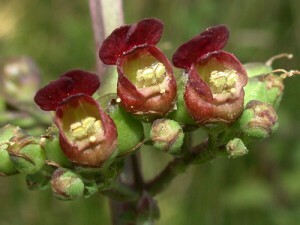 Figwort is effective for healing skin conditions. It provides sufficient body functionality, and thus makes the organism clean of toxic components. It is applied for any skin disease associated with irritation and itching, including psoriasis, and eczema. Its purifying ability partly originates from diuretic and laxative effects. Additionally, it works as a treatment in primary cases of constipation. When used to stimulate heart activity, Figwort is not recommended in case of palpitation and other cases of frequent pulse. Commonly mixed with: To relieve skin conditions, Figwort is mixed with Burdock Root or Yellow Dock. Additional Info: The herb is indigenous to Europe. Preparation and Intake: For an infusion take 1-3 teaspoons of dry leaf extract, fill it up with boiling water and steep for ten to fifteen minutes. The result is consumed thrice a day. In form of tincture the remedy is applied in a quantity of 2-4 ml thrice per day. Safety: There is no data concerning the plant’s safety level. It is possible that the herb interacts with the medicines you use. Before employing the herb, speak to your health-care provider first.